"functional" cures -- give hope that it is possible, experts said here. But if the tempo of development is similar to that of anti-HIV drugs in the late 1980s and early 1990s, a useful strategy is still some years away, according to Steven Deeks, MD, of the University of California San Francisco. "I think we're in 1987," Deeks told MedPage Today -- a period when no drugs were yet available and researchers were just learning such basic things as how to measure HIV in blood and what viral targets for drugs existed. It would take another 8 or 9 years before the first triple-drug cocktails were proved to stop HIV replication and stave off AIDS. Similar basic questions now preoccupy scientists trying to find a cure for HIV, Deeks said here on the eve of the 7th International AIDS Society meeting on HIV pathogenesis, treatment, and prevention. But how long it will take until a safe, effective cure is available remains an open question, commented Nobel laureate Francoise Barré-Sinoussi, PhD, the AIDS society's president. The "sporadic cases" of apparent cure and even much of the basic research being presented at the AIDS society meeting and at a separate 2-day pre-conference symposium on curative strategies are "pieces of the puzzle," she told MedPage Today. The solution of the puzzle may not use all of the pieces being investigated today, Barre-Sinoussi said, but the "knowledge that we are accumulating now" will eventually lead to a cure or remission. But a cure is the next important step in combating the HIV/AIDS pandemic, Deeks later said in a keynote speech to the conference's opening session, because even well-treated HIV has a series of dangerous consequences, including premature aging, dementia, and cardiovascular disease. Given the sheer number of people with HIV in the world -- some 34 million according to the Joint United Nations Programme on HIV/AIDS (UNAIDS) -- those consequences have the potential to overwhelm healthcare systems not geared to deal with chronic disease, Deeks told delegates. The striking case of Timothy Brown, the "Berlin patient," whose HIV appears to have been cured by a hematopoietic stem cell transplant from a donor with a particular immune cell mutation that blocks HIV infection. Data presented here and earlier this year on the "Mississippi baby" -- an infant apparently cured of infection by triple-drug HIV therapy begun within 30 hours of her birth. The "Visconti cohort," a group of French patients treated with antiretroviral drugs in the acute phase of HIV infection who have been able to stop treatment without seeing their HIV rebound. Reports that allogeneic stem cell transplants appear markedly to reduce the reservoir of resting HIV-infected T cells and might actually be curative. But, while those cases are encouraging, they remain anecdotal, commented Sharon Lewin, MD, of Monash University in Melbourne, Australia, who was a co-chair, with Deeks, of the cure symposium, which featured many of the same players as the AIDS society meeting. "Anecdotes never mean much to me," she told MedPage Today, adding she prefers the hard data from clinical trials. 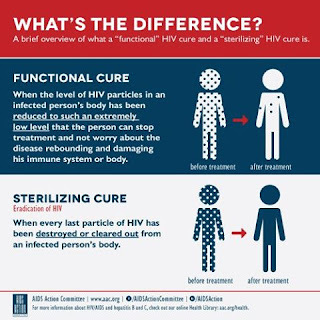 Nonetheless, Lewin said, what much of the evidence seems to be saying is that the reservoir of resting T cells that are infected with HIV must be depleted or destroyed for a cure to have a chance. Those latently infected T cells, though, are difficult to find -- they are infected in the sense that they contain HIV DNA integrated into their genome, but they only rarely lead to HIV replication. But if a patient is not on effective antiretroviral therapy and resting cells become active, the result has long been thought to be a resumption of full-blown HIV infection. That's why the cases of the Mississippi baby and the Visconti cohort are so striking -- they seem to defy that long-held dogma. The problem is that they also seem difficult to apply more generally. Any cure for HIV will have to meet three characteristics, argued Carl Dieffenbach, PhD, of the National Institute of Allergy and Infectious Diseases in Bethesda, Md. It must first of all be safe, he said in a closing talk to the cure symposium. Then it must be less difficult for patients than their current anti-HIV drug regimens. And it must be scalable -- able to be used to treat not hundreds or even thousands of patients, but millions around the world, Dieffenbach said.